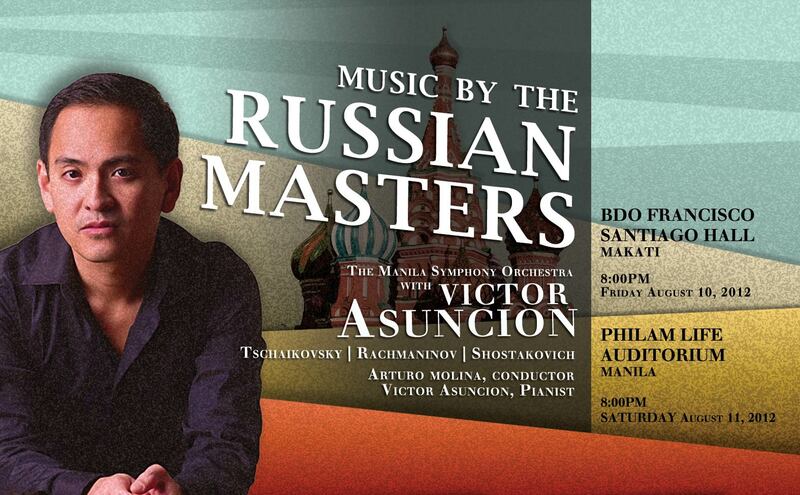 The Manila Symphony Orchestra presents Music By The Russian Masters featuring pianist Victor Asuncion with Arturo Molino as conductor. This will be held at the BDO Francisco Santiago Hall in Makati City on August 10, 2012 (8pm, Friday) and at the PhilamLife Auditorium in Manila on August 11, 2012 (8pm, Saturday). Note: Due to recent calamity that typhoon Gener has brought to Metro Manila and many parts of Luzon region, this concert has been moved to August 18 (Saturday) at 8pm, to be held at BDO Francisco Santiago Hall in Makati City. All tickets purchased for August 10 and 11 will be honored for August 18 concert. Hailed by the Washington Post for his “poised and imaginative playing,” pianist Victor Santiago Asuncion is recognized as a pianist of innate musical sensitivity, fiery temperament, and superb technique. As a recitalist and concerto soloist, he has appeared in major concert halls in Brazil, Canada, Japan, Mexico, Turkey and the Philippines. He played his orchestral debut at the age of 18 with the Manila Chamber Orchestra and his New York recital debut in Carnegie’s Weill Recital Hall in 1999. In addition, he has worked with conductors including Sergio Esmilla, Enrique Batiz, Zev Dorman, Arthur Weisberg, Corrick Brown, David Loebel, Leon Fleisher, Michael Stern, Jordan Tang, and Bobby McFerrin. In addition to his active performing career, Mr. Asuncion is sought after as a piano, vocal, and chamber music coach. He is currently an associate professor of piano, and Director of Collaborative Arts Studies at the Rudi E. Scheidt School of Music at the University of Memphis. He received his Doctor of Musical Arts Degree in 2007 from the University of Maryland at College Park. His principal teachers include Rosario Picazo, Avelina Manalo, Roberta Rust, and Rita Sloan. Check out Mr. Asuncion's web site: http://www.victorasuncion.com.